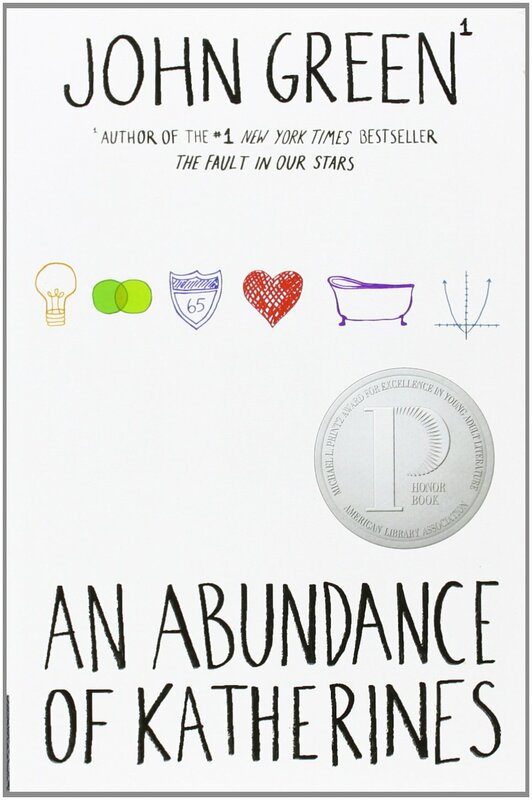 An Abundance of Katherines by John Green – What's She Reading? Colin has just been dumped by Katherine for the nineteenth time. Not the same Katherine nineteen times, but different Katherines. In fact, he’s only ever dated Katherines and they always dump him. Every time. Now his friend, Hassan, is making him go on a roadtrip to nowhere with him. Soon they find themselves in Gutshot, Tennessee with jobs, a place to stay, and new friends. While there, Colin has a “eureka” moment and starts to work on a theorem that can predict the course of a relationship based on the two people involved. As he works on his theorem he hopes that the hole in his gut left by Katherine XIX will start to shrink and that maybe, one day his theorem will make it so that he finally matters. I didn’t really like this book at first. Colin just seemed really pathetic to me and he kind of got on my nerves a bit. He was just so mopey about the breakup! I mean, I guess that was kind of the point, but I found myself getting a little impatient with him and that made me impatient with the book. When he and Hassan first started on their road trip I found myself having a hard time relating with either of them. I didn’t really care where they were going or why they were doing anything. I just felt pretty “meh” about them. Overall the book was pretty good. This was my first experience with John Green. I have Paper Towns right now, but this book didn’t really make me want to read another John Green book. It was good, but not my favorite. I’m not sure that I see myself reading anything else by him in the near future. Violence: Mild. One big fight scene. Language: Moderate. But they did use the word “fug” about 10,000 times (the “why” is explained in the book). Maybe I’ll have to try it. 😊 I want to buy it and reread it but I haven’t gotten around to it. Been buying a ridiculous amount of other books…sigh. An Abundance of Katherines is definiely Green’s worst book and I completely understand your impatience with Colin. John Green tends to write very similar main characters though and especially Looking for Alaska and Paper Towns felt very alike to me. I think whatever people read first is the one they prefer and some even like those two better than The Fault In Our Stars which was just really different to his other books in my opinion. I personally really enjoyed Paper Towns, it’s one of my favourites! I’ll have to give it a try then! I read Abundance of Katherines first too, but I had heard so many good reviews about his other books I decided to read them all anyway. I think this one is probably the lightest of the bunch. I tend to recommend it when parents come in with kids who aren’t quite old enough to read his other works. Thank you so much! I’ll definitely be trying at least one more of his books. It’s hard for me to give up on an author or a series that I didn’t particularly like when I keep hearing good things about them. What a small world! I just read An Abundance of Katherines and reviewed it on my blog. I felt similarly about Colin, he was just so mopey and dopey. And you’re right, Colin/Lindsey ending up together was a little on the trite side, but in the final few pages, it seemed more like a friendship pairing than a romance pairing, especially after the fake-out note. Pingback: May Wrap-Up/June TBR | What's She Reading?